Summary: This book (and others in the series like it) provides a historical narrative of prominent figures in history. This story describes the life or Rosa Parks as a child and her involvement in the civil rights movement through peaceful protest. It describes the bus boycotts and Parks’ fight for voting rights as well. Literary elements at work in the story: The sentence structure and language in the book is simple enough for children to understand, but still a very difficult moment in history for children to grasp and understand. It is appropriate for elementary aged children, perhaps best for children who begin learning about United States History in school. The illustrations are lovely and simple as they portray segregation. There are pictures of the separation of bathrooms and water fountains, and of Rosa refusing to give up her seat on the segregated bus. The back of the book has a timeline of Rosa’s life with actual photographs of her and a brief biography. How does the perspective on gender/race/culture/economics/ability make a difference to the story? In a story like this one, gender, race, culture, and economics are all at play! It is much easier for the adult to understand these concepts than the children who will be hearing the story. The questions I was asked by young children when I read it to them was, “Why? Why were they separated? Why are people mean? Why was Rosa arrested?” In our present day, it is important for us to faithfully dive into these questions, to emphasize the importance of history, how far we have come and how far we have left to go. This book is a wonderful starting place to have discussions in safe places with a basis of faith. Theological Conversation Partners: I recently utilized this book in conjunction with the narrative of Daniel in the lion’s den. We talked about how Daniel and his people were being treated unfairly by the laws of the land, and how Daniel refused to pray only to his king and instead prayed to God. The children came to understand in multiple ways how there are things in the world that are not fair, but God goes with us and it is our call to be faithful to God’s teachings. The story of Moses freeing his people, or the narratives of Jesus’ life where he was shunned by his home town may also be conversation partners. How does the narrative describe Rosa’s childhood? In what ways does Rosa fight for what is right? What does it mean to work together in community? Have you ever witnessed a time when people were treated unfairly because of their skin color or their beliefs? How can you make sure all people are treated fairly? Thanks to Union Presbyterian Seminary alumna Loren Tate Mitchell for today’s book review. 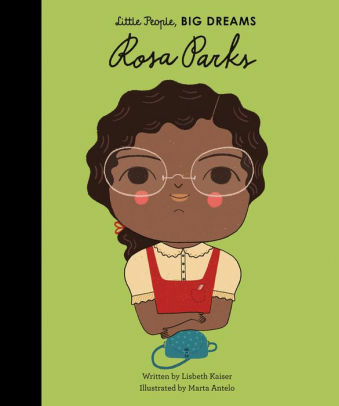 Little People, Big Dreams: Rosa Parks by Storypath is licensed under a Creative Commons Attribution-NonCommercial 4.0 International License.